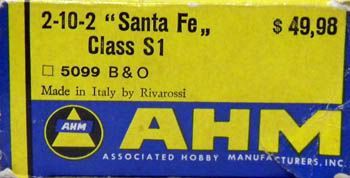 Listed as a new item carrying a May 1967 delivery date, AHM's 2-10-2 "Santa Fe" Class S-1 steam engine was only produced in B&O livery at started life with a $34.95 retail price. By 1977, this steam engine carried a $99.98 price tag; furthered to $249.98 in 1980. This model is not included in the AHM line after its 1980 catalog appearance. This steam engine was made in Italy by Rivarossi for AHM.